It's Pep Rally week and we are here today to share a sampling of the NEW Paper Smooches JUNE release with you! FOUR new stamps and EIGHT new dies will be available to purchase on May 31st at 8:00pm pacific time. Once our release goes live, you will find our new products HERE. Now let's take a looksie at some new Paper Smooches! One of the things I love so much about Paper Smooches stamps and dies is mixing and matching pieces to create little scenes. I'm using one of the new Trees 2 dies for this little summer time scene. I die cut the tree trunk from woodgrain embossed paper. Then I created the "leaves" of the tree by die cutting a mix of cloud dies until I got the custom shape that I wanted. Thanks for stopping in! The next stop on the hop is the amazing Julia Stainton. I'm sure she's got something wonderful to share! That is adorable - I love the shaker part for the tree. Why haven't I seen this a thousand times before? It is great and simple and pretty and just what I want to copy. Did I mention I loved the card? I love your idea of the tree as a shaker, so cute! I love this leaf idea. It woudl e beautiful fro Fall too! I love the shaker tree! Such a great idea. :D what a TWEET composition!!! Too cute shakers are the best, I shared on Facebook and my blog. Such a cute card! The shaker makes it different and a great way to add leaves. Fabulous idea to create the shaker tree using multiple dies! This little tree is absolutely brilliant and I love it! This is wonderful! I absolutely love your design! Love that it is a shaker card. Fabulous shaker card. I love the look and really have to try one one of these days. Clever girl. Great idea for the tree's foliage and that sweet little bird is perfection. Love the. are and tree. What a unique way to use a cloud die, never would have thought of that. What a clever use of your dies! I really love this card! Super cute! Cute saying too! Shared on Facebook. I don't tweet and I don't have my own blog yet. I really enjoy watching you all create gives me such inspiration and gets me excited to create my own blog and YouTube channel to share my gift and inspire others as well. Thats such a great idea to use the tree as the shaker element and those clouds in the backround look amazingly realistic. How fantastic is this shaker card?! I love how you used the cloud die to make the tree shape and how the green sequins look like leaves! Love the tree shaker - can't wait to see more of the release. Adorable! The tree shaker is so fun! Really so sweet!! Awese shaker element and the little bird is adorable. What a cute card. The tree and chick are adorable. Love the tree shaker-so cute with the little birdie! What a super cute shaker card!!! I've tweeted and made a facebook comment! So cute! Great idea to turn it in to a shaker card! The best shaker card ever! what a super cute shaker card! Love it! I have not been into the shaker craze but I really like this card. Thanks for the inspiration! So "tweet"! Love this cute little guy and the green bling of your shaker tree really makes it pop! What a fabulous idea. Love your card! What a cute shaker box!! So cute! Love it! Cool shaker tree! Very inspired. OMG! Love that little birdie! Very creative using the cloud die for a tree. 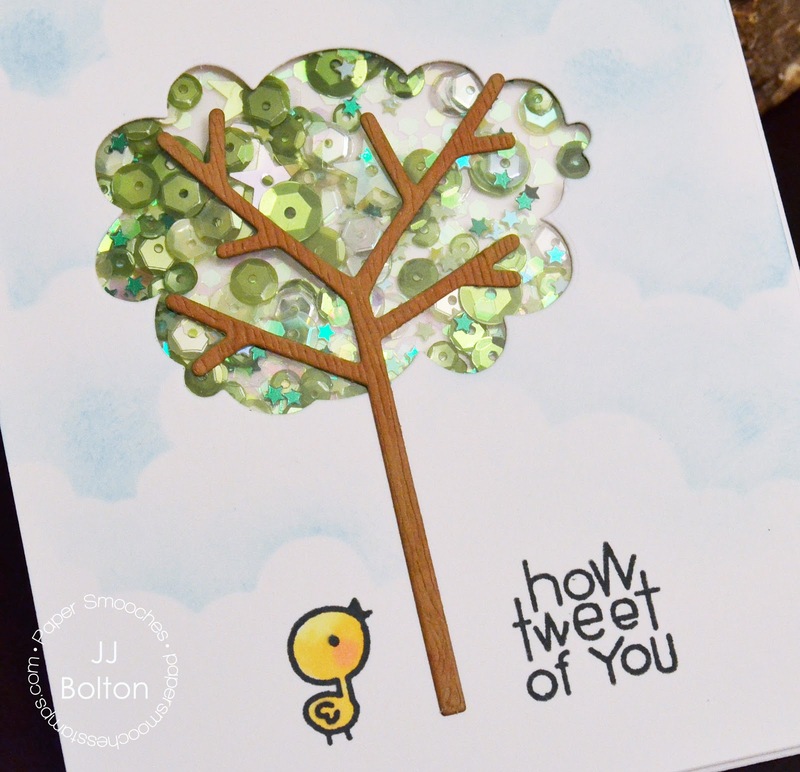 omgosh, I absolutely ADORE everything about your card - the way you created the window for your tree shaker is brilliant! Love the shaker design with the tree branches over or. Great design! The sentiment font is so fun! Sweet sweet card...love the shaker tree and the great use of various PS products. Omgosh! I LOVE everything about this card!!! Shaker cads are amazing! Loves it! What a unique shaker card.. You really told a story. Beautiful shaker card with the tree and darling bird! Cute--I like the clever way you made the tree's leaves. Love your shaker card. What a cool way of making the tree. I adore your shaker card!!! This is so fun and pretty!!! Fabulous job! Great card love the shaker look. I also tweeted about the hop. Awesome way to stretch your dies! Love it! Super cute card; I LOVE shaker cards. What a great idea to use the cloud dies. Very effective use of dies. Thanks for the ideas. Super adorable shaker card, what a cute lil' bird and those sequins are gorgeous! Aww...this is sooo cute, JJ! Love your shaker tree and clouds! Love, love, LOVE that tree shaker! And I'm not just saying that to win a prize!! Beautiful card! Thank you for a chance to win! what a clever idea for a shaker! I love love love this shaker card!! And your cloud background is absolutely gorgeous as usual!! Love your idea of making the tree leaves. Very clever! How clever!! 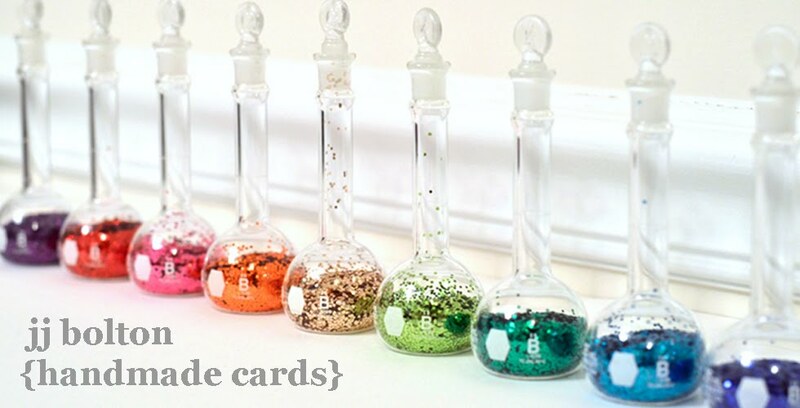 Love your card and the creative way you made a shaker card! How clever to use clouds for your tree! Love it! I love this... What a great way to get some sparkle in nature! Adorable! Clever, cute and a unique look for a shaker card. Love it. This is darling!! I love that fun shaker tree!! So clever and sweet! Love the shaker tree and your cute chick. I just love shaker cards, and this one is SO adorable! Thank you for sharing. Ohh this shaker card is so cute, what a wonderful idea ! Love, love, love this shaker card. Very cleaver! OH, I just love this, what a great shaker card! Love the colored sequins in your shaker!! Great design! Love your delightful design, gorgeous card!!! Your shaker is sooo cute. Thanks for sharing. Wow LOVE your adorable card!! That is a genius card - love how you mused a mix of clouds to get the tree shape and the shaker contents are perfect! That was meant to say 'used', and I've shared on Facebook! What a clever, clever way to use the tree. Your shaker card really makes your card pop! Oh, maybe it's not a shaker card. I love the embellishments. Awesome! You were really "thinking" when you created this clever card. Truly genius ideas make a great card. Amazing! I never would have come up with a tree shaker, love it. Love this shaker card!!! So clever! Great SHAKER CARD! I remember when we did these 20 years ago! And they're coming back with more style! I love it!! Neat idea. I love how you think outside the box and find ways to make your idea work. I love, love, love the shaker design!! Love this shaker tree ,JJ! So pretty! so creative! I must try this cloud cutting 'tree' technique soon! awh this card is incredibly cute! I tweeted about this blog hop! You make the best shaker cards, always so clever! Great card. Enjoying the blog hop too. Cute card...makes me smile. I really like Paper Smooches products. Fabulous card, this is such great fun. It will definitely bring a smile to the face of whoever receives it. Wow how very cute is this shaker card. I love it thanks for sharing this idea. awwwwwwww...this is the sweetest shaker card JJ! Seriously, how CUTE is this shaker idea? Love it! Love, love, love! Note to self: try using clouds to shape a tree. What a gorgeous card and how smart to use the cloud shape as a tree! I would have NEVER thought of that! Thanks for the chance at the awesome giveaway! WOW! This is SUCH a cute idea for a shaker card!! LOVE that tweet birdie!! so cute and fun shaker card. Thanks for sharing. Love your shaker tree! Such a clever and cute card! Oh I adore this sweet card! This is SO adorable! I love trees AND shakers so this is the perfect combo! Great, colorful card! Oh my gosh, the card is so cute..and the shaker is fabulous! This is so fun! Love shaker cards! The clouds look so good. Very cute card. Wow! So creative to use a cloud die cut for a shaker card and incorporate it into your tree. Very clever. I LOVE shaker cards ! Fantastic !!!! OMG Super clever and oh so cute! Love this shaker! 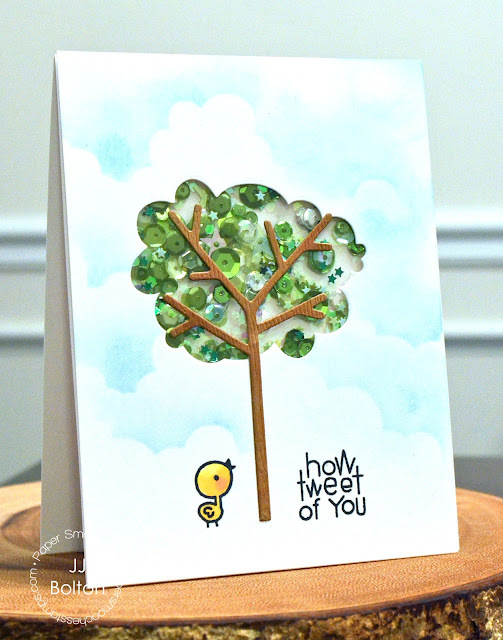 What a fun card ... love the shaker tree! Great background too. I wish I could have a tree like that in real life- SO beautiful! Green sequins tree is so lovely and the little bird ... so cute. I love the shaker tree, what a great idea!! Just love the shaker tree, brilliant idea!! Like the shaker style card. Especially like the blue sky & white cloud background. LOVE LOVE LOVE the shaker tree!!! Great tree and a shaker card too! So creative! Love those soft clouds too! What an adorable card! I love the cute bird and shaker element, thanks for sharing. OMG!! Such a FABULOUS shaker card!! Oh How TWEET!!! Love this, JJ! It's probably the best shaker, I've ever seen. Thanks, Paulette S.
This is a great shaker card! I love how you put the wood of the tree on the outside so it's more visible! The chick is adorable, too! This card is AWESOME! I love shaker cards! ! Awesome shaker card! I love your idea! Never seen a tree used as a shaker before...fantastic card.